We often get asked various questions by patients visiting our Clinic about cataracts, how they develop, the cost of Cataract Surgery, the treatment for “getting rid” of them and the recovery period required after surgery. 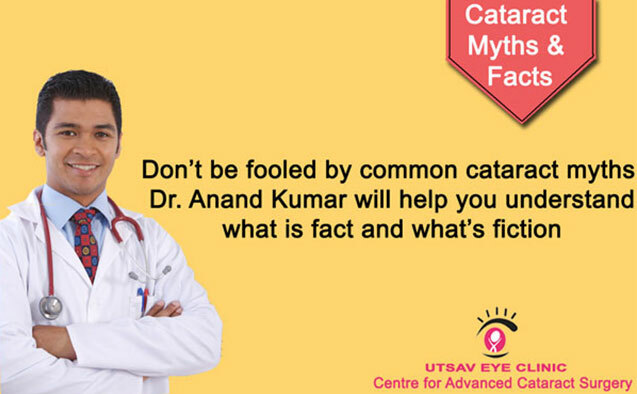 Here are our five most common myths surrounding cataracts and the facts as uncovered by our Cataract Specialist in Kharghar Navi Mumbai, Dr Anand Kumar. FACT: Pharmaceutical companies promote many eye drops as cure for cataract. However there is no good evidence from clinical studies that any eye drop can cure cataracts to date. The only proven treatment for cataracts is Cataract Removal. FACT: Cataracts occur due to age related changes in your natural lens. These changes are not reversible with time, drops or tablets. The only way to treat cataracts is to remove the cloudy lens with surgery and replace it with a clear artificial lens called as intra-ocular lens (IOL). FACT: This myth may have arisen from the fact the cataract surgery was more risky in the past. The risk may not have been taken because of the potential complications of cataract surgery. Thankfully cataract surgery is far safer nowadays and we can safely operate on patients who have symptoms – however mild or severe. Waiting for cataracts to ripen or mature may actually make cataract surgery more technically challenging and potentially more risky, so it’s not a normal practice to wait for the cataracts to ripe. FACT: With the latest technology and advanced surgical techniques, cataract surgery recovery has been dramatically reduced. It is true that in the past cataract patients were admitted for a week before surgery, their surgical time could be more than an hour and the recovery time was spent in hospital for many days. The main reasons why we don’t have to do this anymore, is that our skills and technology are more advanced now, the wounds we create are much smaller without the need for stitches and our dramatic reduction in infection rates due to preventative antibiotics that are placed in the eye at the end of cataract surgery. At Utsav Eye Clinic, we practice No injection, No pad technique for cataract surgery which makes the surgery even more comfortable and safe. FACT: While it is true that if most people live long enough, they will eventually get cataracts, not all people with cataracts are greater than 60 years of age. Cataracts are seen in all age groups – even newborns born with congenital cataracts. Nowadays even younger people are getting cataracts, maybe due to our changing lifestyles. Take our FREE Cataract self assessment test to find out if you have cataracts. Make an appointment with our Cataract Specialist in Kharghar Navi Mumbai by filling the adjoining form or call us on 022-27742553, 9920442553.